The Honest Kitchen Bone Broth may be the nourishing way to add moisture to your cat’s diet – no time-consuming preparation required. Before we jump into our review of The Honest Kitchen Bone Broth, let’s talk about what bone broth is and what makes it special. Don’t confuse bone broth with traditional broths found at the store – bone broth is a long-cooking, gelatinous stock packed with nutrition, while “regular broth” is essentially meat or vegetable flavored water. Bone broth is made by slowly cooking down bones in water, preferably for at least 24 hours. 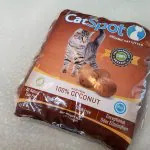 It’s widely used to supplement the diets of senior cats and as an appetite stimulant for cats who are refusing food. Bone broth is a good choice for cats who are recovering from digestive troubles and need to be eased back into eating solid foods. What makes bone broth special? 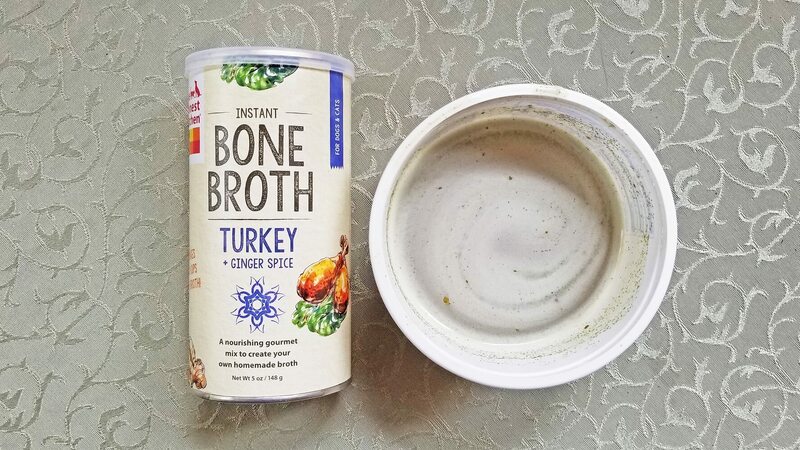 The nutrients within the bones leach out during cooking and give bone broth a distinct advantage over its faster-cooking cousin, traditional broth. 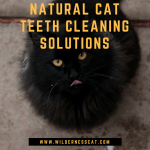 The cartilage cooked into bone broth contains chondroitin sulfates A and C, which are often used as anti-inflammatories and can help cats with osteoarthritis. The collagen (gelatin) found in the broth is full of amino acids and can help improve your cat’s digestive function. Bone broth contains a wealth of minerals such as calcium, phosphorus, magnesium, sodium, and potassium. These minerals are vital to our cats’ health, and bone broth can help anorexic cats obtain them. Bone broth sounds great, right? Unfortunately, homemade bone broth takes a long time to make – like I mentioned, a good bone broth is simmered for at least 24 hours. Not everyone has the time to stick around home to nurse a pot on the stove. Does this mean busy people need to give up on bone broth and leave our cats broth-less? Thanks to products like The Honest Kitchen Bone Broth, the answer is no. If you want to skip straight to our review of The Honest Kitchen Bone Broth, click here. The Honest Kitchen story begins in 2002. Lucy Postins’ dog, Mosi, was plagued with skin problems and ear infections. 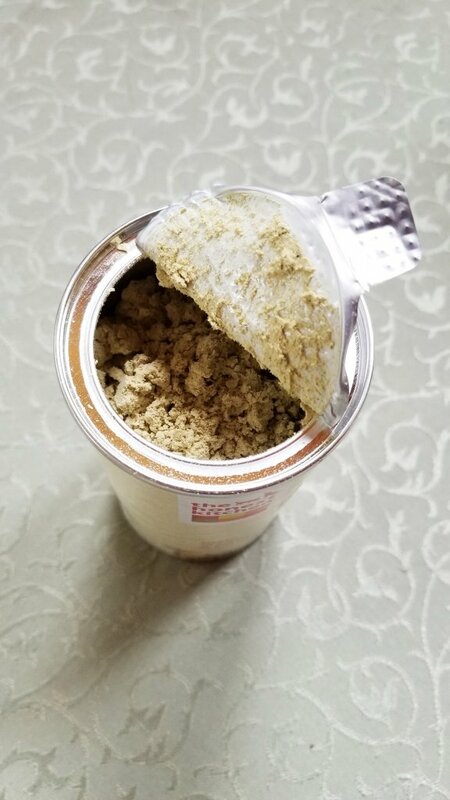 Knowing that diet is integral to overall health, Luci started making dog food at home in her kitchen, dehydrating the food so that it was easy to prepare and store. 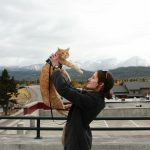 Despite the benefits for Mosi’s health, Lucy was frustrated by the amount of time she was now spending in her kitchen and realized that others were probably just as fed up with the time-consuming nature of cooking for pets. At the encouragement of her friends, she set up a website selling homemade dog food – and that was the beginning of The Honest Kitchen. Today, The Honest Kitchen specializes in dehydrated homemade-style food for pets. All Honest Kitchen products are certified Human Grade, meaning they are considered edible by the FDA and subject to about 100 manufacturing and quality control regulations. The food is made in FDA approved facilities which are held to the same standards as human food facilities. We’ve been well aware of the nutritional power of bone broth for years but seldom fed it to our cats. The process of preparing bone broth is time-consuming and since the cats were doing fine without it, it just never seemed worth the effort. When we had the opportunity to try out The Honest Kitchen’s bone broth, we were excited to see what this nutritional powerhouse could do for us. 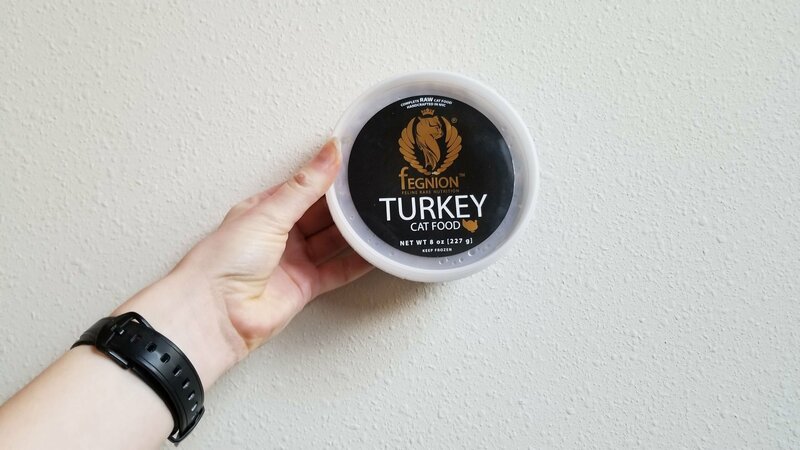 Turkey is always a hit with Wessie (he adores Thanksgiving leftovers), so we went with the Turkey + Ginger Spice recipe. Dehydrated turkey broth, dehydrated turkey, dehydrated lentils, dehydrated kale, ginger. 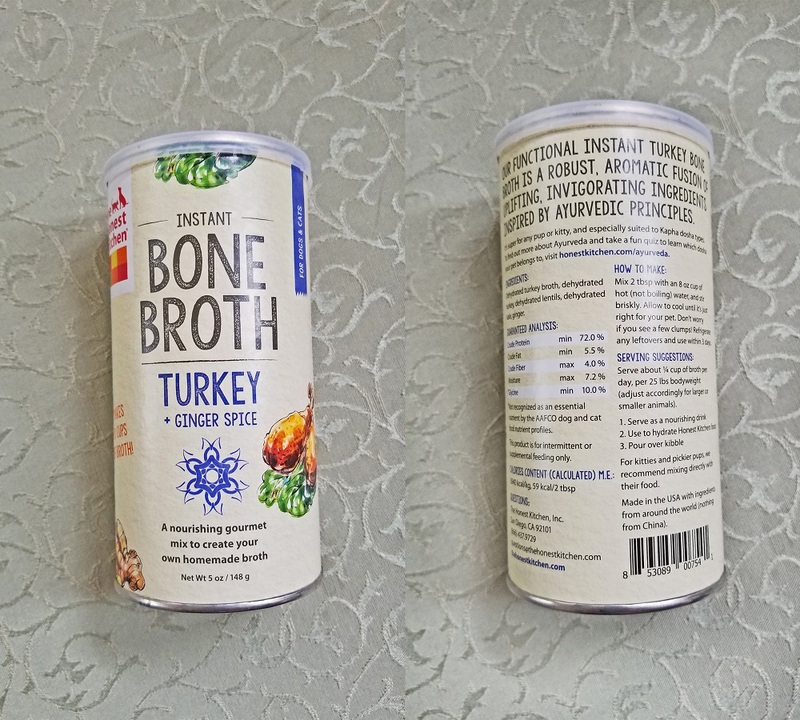 The first two ingredients of The Honest Kitchen Bone Broth are excellent – dehydrated turkey broth and turkey retain their nutrient composition and provide the benefits of a regular bone broth. The next two will look a little questionable to any cat guardian feeding their cat a meat-only diet. 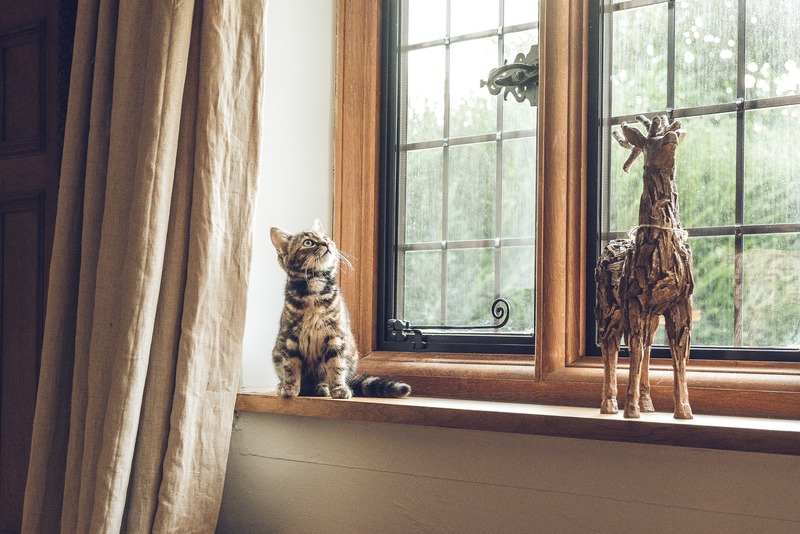 While cats are obligate carnivores and should be fed a primarily meat-based diet, the dehydrated lentils and kale can provide beneficial vitamins and minerals. Since the bone broth is a dietary supplement and not your cat’s main source of nutrition, these ingredients are unlikely to do any harm. Finally, the recipe wraps up with ginger. Ginger is well known for its power to soothe the digestive tract and can be a great healing addition to your cat’s diet. Ginger is a safe way to help with nausea, digestive issues, and travel sickness. Unlike most prepackaged “human” bone broths, The Honest Kitchen Bone Broth is free from ingredients which are harmful to cats, like onions and excessive salt. The Honest Kitchen Bone Broth comes in powder form within a 5 oz canister (that’s 10 cups of broth). The powder is briskly mixed with warm water in order to create the broth. The Honest Kitchen recommends you mix up 1 cup of broth at a time: 8 oz of warm – not hot – water to 2 tbsp of broth mix. They suggest feeding ¼ cup per day, per 25 pounds of your pet’s body weight. Wessie weighs 13 pounds, so we would be serving him approximately ⅛ cup or two tablespoons a day. I used a fork to mix the broth powder with water, and it blended quickly. You might notice powder clumps in the broth. They are nothing to worry about but can be blended with a little extra whisking. Once the broth is mixed up, it must be stored in the refrigerator and will stay fresh for up to three days. Since we’re only feeding ⅛ cup per day, it would be a good idea to only make a half batch so we wouldn’t have to toss out any unused broth. If your cat was raised on kibble and absolutely refuses to switch to a moist diet, the addition of bone broth to their kibble would be a great way to increase their water consumption. Personally, we don’t agree with feeding dry foods. Want to know why? First, we offered the broth on its own. Wessie gets a lot of water in his food, and it’s rare that he drinks it straight from the dish. The water dish is almost only used during hot and sunny adventures when he needs the extra hydration. I was interested in seeing whether or not the bone broth alone was appealing enough to get this well-hydrated kitty interested in lapping up some extra nourishment. I offered Wessie a small dish of broth in the morning before he had breakfast, and he showed a little bit of interest initially, most likely in the hope that breakfast had been served. After a moment of sniffing, he turned up his nose and resumed his work of reminding me that he needed to be fed. I tried dabbing a drop of the broth on his nose to see if the taste would get him interested, but he wasn’t having it. Breakfast or nothing. Maybe some cats will love the flavor enough to drink it plain, but I don’t think that’s happening with our usual non-drinker. Then we mixed the broth into Wessie’s food. Wessie always gets extra water in his food, so the soupy consistency of his food with the broth added was what he was already used to. I was curious to see how he would react to the turkey + ginger combination. While Wessie loves turkey, I wasn’t sure how he’d feel about the inclusion of ginger. It was hard to detect any reaction to the broth at all – Wessie is always enthusiastic about mealtime, and he was similarly enthused about his meal with the addition of the broth. While he didn’t act like it made his food any more amazing than usual, it certainly wasn’t a turnoff for him. We had no trouble feeding the broth, but some customer reviewers say their cats are repelled by the spices in The Honest Kitchen broths. 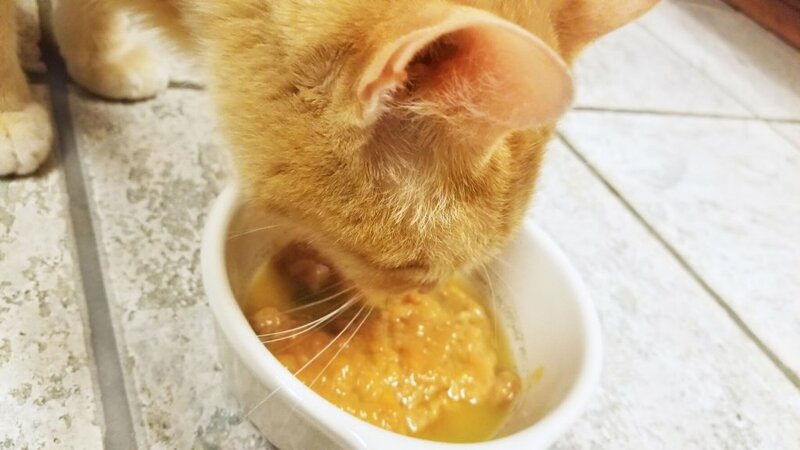 The broth does smell strongly of ginger, so if your cat is usually uncertain about trying new foods, I recommend starting with a very small amount of broth mixed into their meal and increasing from there. Honest Kitchen pet foods are human grade. So, we tried it, too. Remember, all Honest Kitchen products are human-grade, which means they fit the FDA’s requirements to be considered edible by humans. 100% Human Grade: This product is made with human food grade ingredients. It contains no animal feed grade ingredients and is made in a human food production facility but is intended for your dog/cat to eat, not you! Alright, it’s not intended for me, but that wasn’t going to stop me. If a company claims their pet food is safe for me to eat, then I will test it. 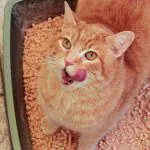 I don’t like to feed our cats food that I wouldn’t eat – unless it’s raw meat – the human digestive tract isn’t made to digest raw meat like a cat’s is, so I don’t recommend snacking on raw chicken strips. The broth was thin and had a hint of meaty flavor with an overtone of ginger spice. There are small flakes of dried turkey in the mix which extra texture and character to the broth. It was a bit more watery than I would have liked, but this could easily be changed by adjusting the water:powder ratio. 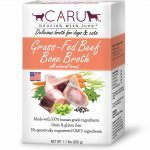 Am I going to replace my cooking broths with The Honest Kitchen Bone Broth for pets? No, but I do like feeding the cats food that I could feel comfortable eating. The Honest Kitchen Bone Broth mix takes out the hassle of simmering down your own broth and makes serving your cat bone broth incredibly easy. Storage is simple since you only rehydrate as much as you need at one time. You don’t need an extra freezer to store your broth. In essence, this stuff takes a process that is traditionally time-consuming and makes it easy peasy. If you have a senior cat with aching joints, a sick cat who isn’t eating much solid food, a cat with digestive troubles, or just want to add more moisture to your cat’s meals in a tasty and healthful way, The Honest Kitchen Bone Broth may be worth a try. 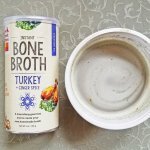 Where can I buy The Honest Kitchen Bone Broth? 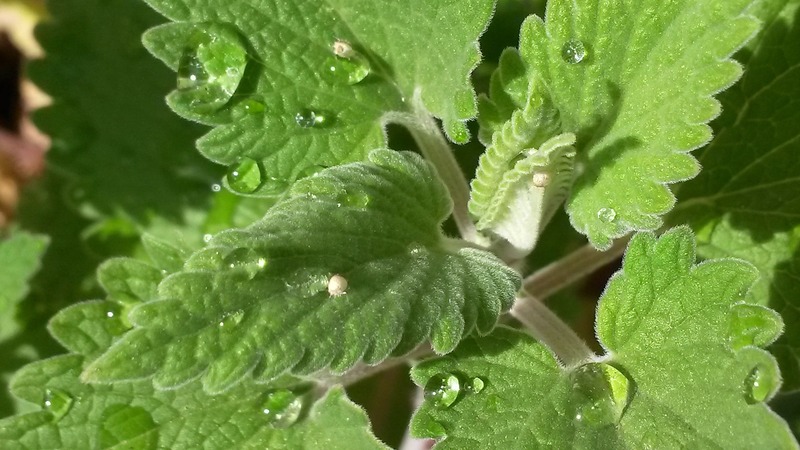 Cat UTI Home Remedies – You CAN Help Your Cat! 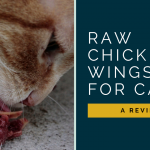 Wessie Reviews It: Should You Feed Your Cat Raw Chicken Wings? 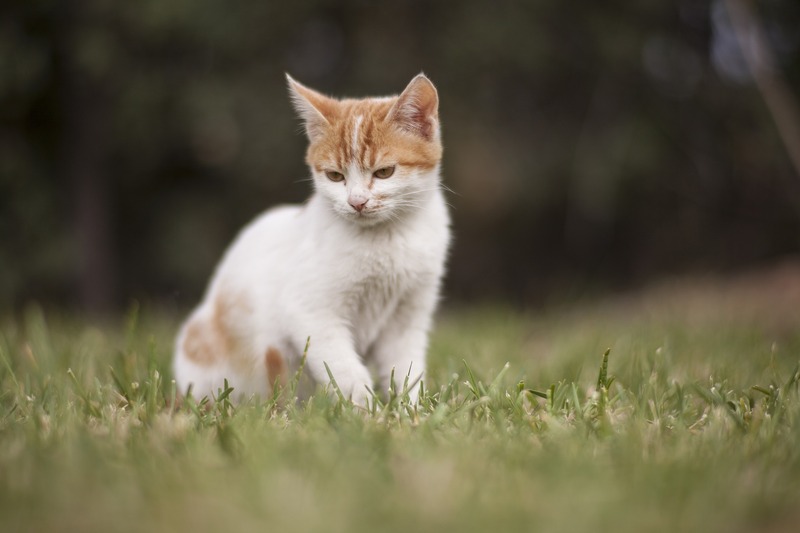 How Can You Tell if Your Cat is in Pain? 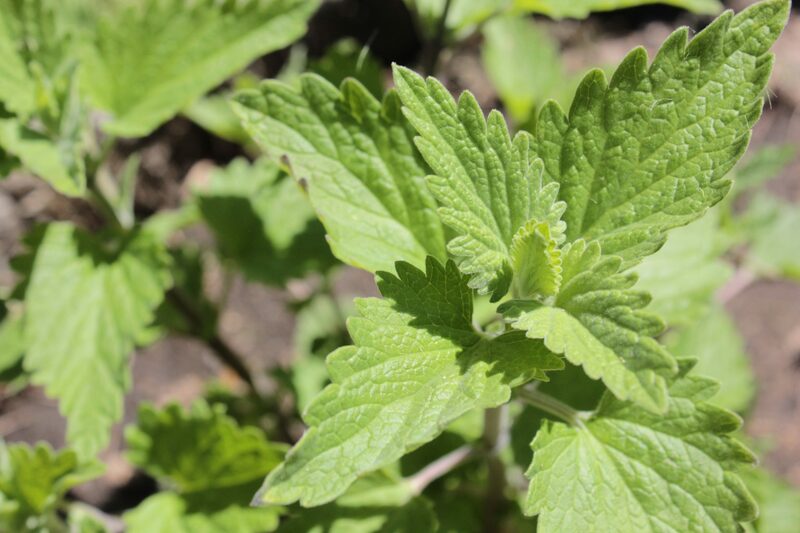 Is Organic Catnip Better for Cats?